It is a false impression that there was only one Native American language. In fact, there were possibly a thousand languages spoken in the Americas before the Europeans arrived. Furthermore, these languages showed huge variety between each other. The languages spoken were neither simple nor primitive. The complexity of the grammar was as those of Latin and Russian. With the exception of the Mayans and neighboring tribes close to the Yucatan peninsula, Native American languages had no writing system till the Europeans arrived. Communication by means of writing was limited to the Aztecs and Mayans. They used pictures as a form of writing to express their ideas. Around 800 of the symbols or hieroglyphs used by the Mayans were known and recently, progress was noticed in deciphering them. Another Native American language method is the sign language. It was used in several areas to be able to communicate with other tribes. It is a nonlinguistic means of communication that used arms and hands gestures. 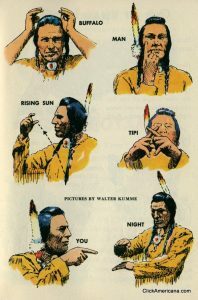 An advantage of using sign language as a Native American language method was to make communication possible between tribes with different languages. Also, smoke was used by Native Americans to send some simple information like “enemies near the area” or agreement that was previously agreed upon. The influence of the Native American language is present in the official languages today such as English, Portuguese, and Spanish. In English, for example, words such as moose, raccoon, tomahawk, and wampum came from native North American languages. The words tomato, coyote, and chocolate came from native Mexican tongues; cannibal, barbecue, hurricane and potato from West Indies and condor, jaguar, puma, and tapioca from South American tribes. 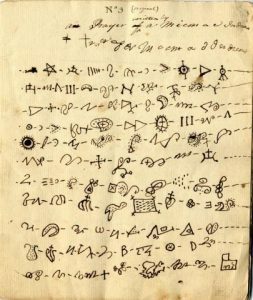 Some of the Native American languages like the Apache, Cherokee, and Navajo were used for communications during the U.S. military war to avoid enemy decipherment. Most Navajo joined the American armed forces as the transmitters of important messages using their native languages. Native American languages survival is not good. Most of them will possibly die out. Currently, the Native American languages are slowly being replaced by the tongues of the Indo-European from the European conquerors and settlers. Various Native American groups in the U.S. are revitalizing the languages of the native Americans resulting to increased indigenous consciousness and attachment to cultural identity. During the 20th century, there was a rising number of means to study Native American languages through language-learning facilities like language camps, tribal classes, and college courses about indigenous languages.